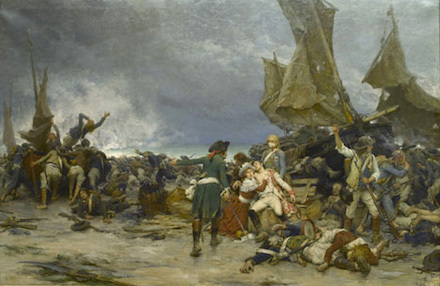 On this date in 1795, general Charles de Virot, marquis de Sombreuil was shot for leading the royalist invasion of Quiberon in the west of France. 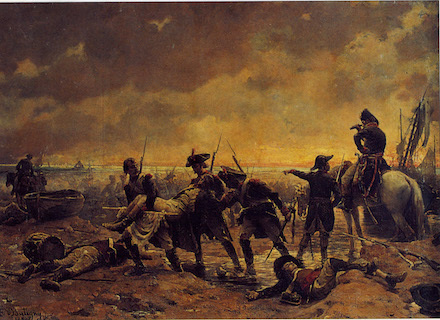 It was not even a year since the end of the Paris Terror — indeed, Sombreuil would have the honor of dying on the anniversary of Robespierre’s beheading — when 5,000 emigres backed by British ships crowded like sardines onto a peninsula famous for canning them, intending to join and lead the domestic Chouan resistance. Amid the uncertain interim of the Directory a yet-Republican France wracked by war, economic crisis, and political uncertainty looked ripe for the overthrow. And true enough, the Directory in time would give way to a king of sorts. The west of France, in Brittany adjacent the Vendee which had long troubled Jacobin rule, ought to have been the place to raise the fleur-de-lis but the expedition as cogitated from London was plagued from the start by disorganization and came to a speedy grief in June and July of 1795, remembered only in the dourest of palettes. An episode in the affair of Quiberon, by Paul-Camile Boutigny. An episode in the rout of Quiberon, by Pierre Outin. A mere pup of 25, Gen. Sombreuil had already lived long enough to quaff the Revolution’s horrors: his father and brother had fallen under the sans-culotte blade in Paris in 1794, while his sister is famous for literally quaffing the blood of the guillotined to prove her loyalty and thereby save her family from the September Massacres. Our man Charles shared the ill fruit of Quiberon with 747 other captured prisoners as the Republicans made policy of showing no mercy to invading emigrants. They were shot over a period of weeks at Quiberon and nearby Vannes and Auray; a nearby grounds would become hallowed of the Bourbon restoration as the Champ des martyrs with the burial of these martyrs’ remains. A expiatory chapel to their memory still stands there to this day.